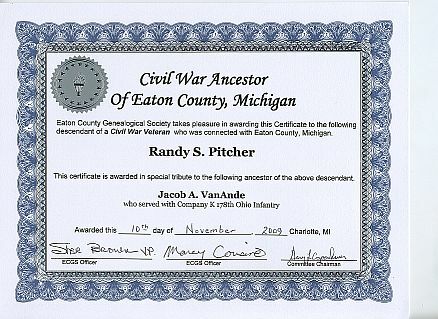 Our Civil War Ancestors program includes Civil War ancestors who were connected with Eaton County, Michigan. They could have been born, resided, enlisted, died or buried in Eaton County, regardless of the unit or state they served. If desired, this includes an Eaton County Genealogical Society Civil War Ancestor Certificate ($4.00, suitable for framing). See more information on the certificate below. We invite you to share your Eaton County Civil War Ancestors with us! Your information will be indexed and included in our database for others to use for their research. Print out the attached form, fill in your information and mail to us at Eaton County Genealogical Society, P.O. Box 337, Charlotte, MI 48813. We would like Eaton County ancestors included on this form. If you have Microsoft Word, save the attached Word file form, on your computer, type in and save your information and e-mail the form back to us. We would like Eaton County ancestors included on this form. E-mail your GEDCOM file from your favorite family tree software. All ancestors may be included in the file. Our database system allows access to these files by a click of a button. If you do not want living relatives included, please exclude them when you create the file. If you would like to include the ancestors that are associated with Eaton County, this will be very welcome. If you do not wish to, we will find the people who were born or who died in Eaton County. In the method we use to do this, we do not see people who were married or who lived in Eaton County. If you would like a certificate, please fill out the above application (attached form), remit $4.00 and mail to Eaton County Genealogical Society, P.O. Box 337, Charlotte, MI 48813.